I was joking with a friend recently that someday I'll be like Oprah and give out my favorite things to everyone I know. Since I do love gift guides this time of year, here is a year-end/I-didn't-get-it-together-before-the-holidays/maybe-you've-given-a-bunch-of-gifts-and-now-you-want-a-treat guide to some of my favorite things from 2014. My aunt and uncle in Seattle gave us this tea as a wedding gift this May, and it has become my absolute favorite. 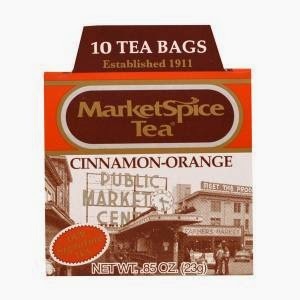 This tea has a great, bright flavor that has been perfect on chilly days (like today, as I write). I will definitely be ordering more when I run out! Made in Ann Arbor, this hot sauce is flavorful without being overwhelming. Eric and I tried it at Zingerman's one afternoon and bought a bottle immediately. It goes well on just about everything and is now a staple in our pantry.